Blunt trauma causes short-term compression of some or all parts of the chest, abdomen or pelvis and changes hemodynamics of the blood. Short-term compression caused by trauma also results in a short-term decrease in the diameter of blood vessels. It has been shown that with a sudden change in the diameter of a tube or in the direction of the flow, the slower-moving fluid near the wall stops or reverses direction, which is known as boundary layer separation (BLS). We hypothesized that a sudden change in the diameter of elastic vessel that results from compression may lead not only to BLS but also to other hemodynamic changes that can damage endothelium. We applied Navier-Stokes, multiphase and boundary layer equations to examine such stress. The method of approximation to solve the BL equations was used. Experiments were conducted in an aerodynamic tube, where incident flow velocity and weight of carriage with particles before and after blowing were measured. We found that sudden compression resulting from trauma leads to (1) BLS on the curved surface of the vessel wall; (2) transfer of laminar boundary layer into turbulent boundary layer. Damage to the endothelium can occur if compression is at least 25% and velocity is greater than 2.4 m/s or if compression is at least 10% and velocity is greater than 2.9 m/s. Our research may point up new ways of reducing the damage from blunt trauma to large vessels. It has the potential for improvement of safety features of motor vehicles. This work will better our understanding of the precise mechanics and critical variables involved in diagnosis and prevention of blunt trauma to large vessels. Blunt trauma to large vessels is well recognized outcome in patients with chest, abdominal or pelvic contusion [1, 2]. Thoracic aortic rupture carries a mortality rate of over 90%, with on-scene death occurring in more than 80% of individuals with this injury [1, 2]. Even minimal aortic injuries are important, since the potential adverse consequences of not operatively repairing minimal aortic injuries, defined as a small (<1 cm) intimae flap with no or minimal periaortic hematoma, include formation, enlargement, and rupture of pseudoaneurysm, embolism of loose intima, or thrombus and progressive dissection of the aortic wall [3, 4]. Compression of the chest, abdomen or pelvis as a result of injury changes hemodynamics of the blood. This short-term compression also causes a transient decrease in the diameter of the aorta and other blood vessels. Fox and McDonald have shown that a sudden change in the diameter of the tube or in the direction of the flow, causes the slower-moving fluid near the wall to lose momentum and stop or reverse direction . In such situations, the core flow is then separated from the wall by a fluid disturbance or separation zone . Boundary layer separation (BLS) has also been shown to appear due to adverse pressure gradients (i.e. pressure increasing in the direction of the flow) . It is important to note, however, that BLS does not take place in an elastic vessel under normal physiological conditions . In this work, we tested the hypothesis that a sudden change in the diameter of an elastic vessel that results from compression can cause not only BLS but also other hemodynamic changes that cause large vessel injury via damage to the endothelium. We further explored and analyzed shear stress at the compressed part of the vessel and conducted a series of experiments to explore certain hemodynamic changes upon compression caused by injury. All experiments were conducted in aerodynamic tube (AT) with a square section (200 × 200 mm2). The experimental part was located at a distance of 6.0 m from the rectifying lattices. In order to shape the flat laminar boundary layer (LBL), a polished steel plate with sharp edges was used. The upper part of the plate was combined and had carriage with the particles. To avoid BLS, the transverse joints of the walls of a carriage and separate steel plate were thoroughly condensed and painted over. A steel plate was placed into the wind tunnel and was blown during the specific time. The specific goals of the experiments were: (1) to measure incident flow velocity and (2) to determine the weight of the carriage with particles before and after blowing. In all experiments, the degree of turbulency of incident flow was approximately the same and equal to 0.13%. Compression caused by trauma leads to stress (stress is defined here as the force applied to a certain surface). We applied fundamental differential equations, namely Navier-Stokes, multiphase and boundary layer (BL) equations, to examine such stress and evaluate the related hemodynamics as well. In the equations below (unless otherwise specified) we will assume that ρ is blood density; u is longitudinal blood stream velocity near the vessel wall (inside the BL); v is transverse blood stream velocity near the vessel wall (inside the BL); U is longitudinal blood stream velocity in the center of the vessel; y is transverse blood stream velocity in the center of the vessel (see figure 1); p – pressure; μ – viscosity; t – time; τ – shear stress; ω – acceleration. Physically it can be described as follows: A flow that is "broken" in the BL has so little kinetic energy that it cannot move further toward the high-pressure area so this flow moves away from the vessel wall and toward the axial (central) flow. Thus, injury creates conditions for BLS. Note that there is no BLS under normal physiological conditions, although certain events can cause such separation . Compression can create conditions for accelerated blood flow movement along a relatively curved surface of the vessel and along a relatively flat surface of the vessel. Let's examine the motion on the curved surface. The similarity law is used. A mobile BL is formed when the body moves with acceleration and vessel surface is covered by accelerated flow. Schlichting has provided calculations for accelerated motion of a body in the standing fluid . According to these calculations, within the range of Reynolds number of 2,000 – 20,000, time necessary for BLS changes from 0.039 to 0.392 s.
Theoretical studies  have shown that the length of time necessary for BLS depends on the type of acceleration. According to Schlihting , motion can be sudden (type I) and accelerated (type II). where t det achment denotes the point that removes the BL (it appears in special cases examined below). Let's examine the motion on the flat surface in the LBL. Let's establish the connection between the damage to the endothelium (removal of particles from the vessel wall  and shear stress. Taking into account the similarity law (mechanically similar flows) namely the ratio of inertial forces to the frictional forces, an AT can be used to study the damage inside the BL within the range of Reynolds number. For the Reynolds number of the canine ascending aorta , the peak value for the velocity is: 1,587 < Re < 11,500 and for human ascending aorta : 2,645 < Re < 12,566.
where x is a distance from the anterior edge of the plate; v is kinematic viscosity; u∞ is incident flow velocity. 1300 ≤ Re ≤ 100,000 which is considerably less than the critical number (2.3.1) for the flat surface. For the more detailed analysis, let's examine a mathematical model. To describe the above process, two-phase model is used . Generally, this model is used to describe blood flow in the large arteries or filtration of fluid through the capillary wall . Polyphase models are based on the idea of interacting and interpenetrating media . The system of particles (for the two-phase flow) in this model is replaced by mathematical continuum . In addition, it is assumed that particle size is considerably less than the distance at which flow conditions may change . Let's examine damage caused by accelerating motion. To examine the LBL at an accelerated flow, experiments were conducted using the methods discussed above except that the circumfluent steel plate was added to create a fast delayed flow. Within the range of Reynolds number of 2,000 – 20,000, time necessary for BLS changes from 0.039 to 0.392 s . It is well known that peak velocity of blood flow in canine aorta changes within the range of Reynolds number 1,587 to 11,500 and in human aorta from 2,645 to 12,566 . Theoretically, injury causing sudden compression of the aorta can happen within the range of Reynolds number of 2,000 – 20,000 and within 0.039 to 0.392 s. Therefore, injury that causes sudden compression may result in BLS. Note that there is no BLS under normal physiological conditions, although certain events can cause such separation . Let's examine shear stress for these 2 types of motion. Therefore, shear stress appearing on the vessel wall for the first type of acceleration (sudden) is 3 times higher than the stress caused by moderate acceleration. Thus, the value of shear stress depends on the type of acceleration. where μ – fluid viscosity, u – average velocity, d – vessel diameter. Where α is Womersley parameter . may not only cause damage to the endothelium but also lead to atheromatosis . Acceleration in this case cannot initialize BLS. Therefore, sudden compression caused by injury is detrimental if it happened within the range of Reynolds numbers specified above and within the corresponding time interval. Where α is a coefficient of local shear stress . 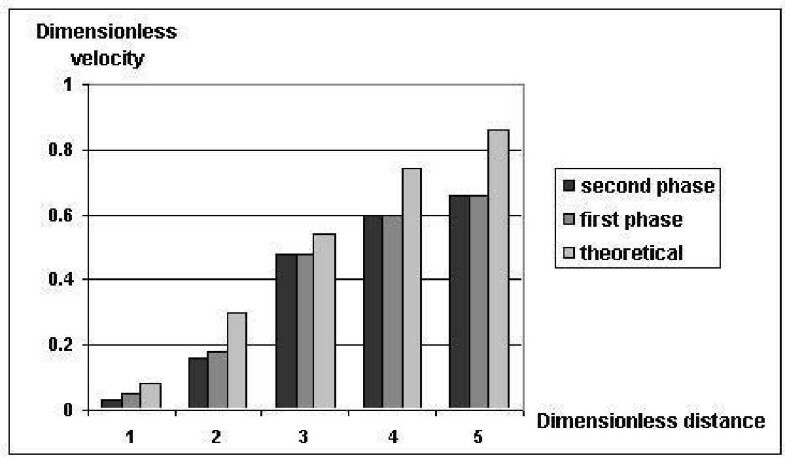 Figure 2 provides the summary of results. According to this figure, the damage is influenced by the incident flow velocity (the greater the velocity the greater shear stress (along the longitudinal axis)). Therefore, the damage is a function of shear stress. The damage of the wall on the longitudinal coordinate and the velocity of the incident flow in the laminar boundary layer. Horizontal axis: incident flow velocity ( ); Vertical axis: damage ( ). Legend on the right: distance (m). Written above u 1 and u 2 are longitudinal components of velocity; v 1 and v 2 are transverse components of velocity; f1 and f2 – initial distribution of the velocities in the BL; and initial distribution of the densities. The beginning of the 2nd phase (due to the removal) was determined according to the calculated shear stress and the corresponding removal according to the experimental data. The system of equations (3.4.1) – (3.4.6) with boundary conditions (3.4.7) – (3.4.9) was solved numerically by means of application of the finite-difference method with order of approximation equal to 0.0001. Figure 3 reflects the distribution of the transverse velocity of the first and second phase. According to this figure, the denser phase moves to the wall, carrying the flow to the wall and causing an additional mixture of the main flow with the wall flow. This denser phase creates additional tension on the wall unless we assume that the second phase is an ideal flow. The distribution of transverse velocity. Along the horizontal axis: dimensionless distance; along the vertical axis: dimensionless air-stream velocity. Legend on the right: phases. where θ 1 is the expenditure of the carrying phase; θ 2 is the expenditure of denser phase; μ 1 is a coefficient of dynamic viscosity; is pressure gradient, R is a radius of a pipe. Shear stress will be then determined by the formula: , where f 0 is a dimensionless velocity. and in the mentioned above boundary conditions only the condition v 2 = f 3(τ 1) will be changed to v 2 = f 3(τ 1, τ 2). The changed system of equations with changed boundary conditions was solved numerically by means of application of the finite-difference method. 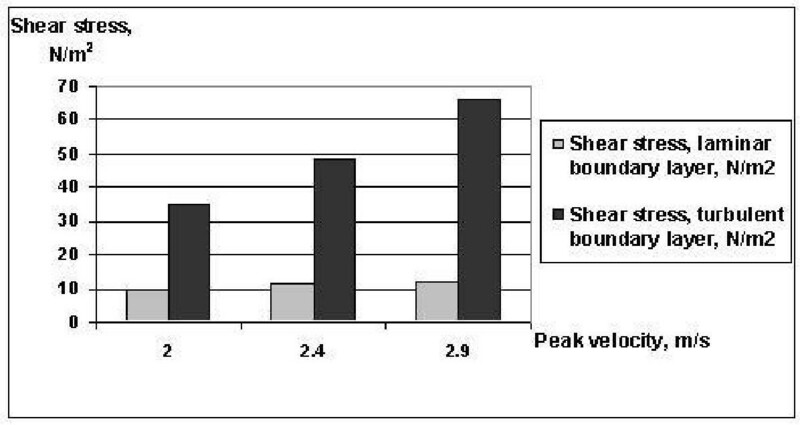 According to figure 4, shear stress of the second phase is increasing to a certain value while shear stress of the first phase is decreasing. Therefore, stress which is created by the second phase (erythrocytes) can reach the same order of magnitude as the carrying phase. Large stress inside the second phase (erythrocytes) may potentially lead to the endothelial damage and erythrocyte deformation . To check this statement, experiments were conducted (in accordance to methods discussed above). The results of these experiments are given below. Change in shear stress of 1st and 2nd phase along the longitudinal coordinate (x). Horizontal axis: distance (m); vertical axis: shear stress ( ). Legend on the right: first and second phases. Table 1 shows the results of the experiments. According to table 1, experimental damage (3rd column) considerably exceeds the theoretically calculated damage. In addition, as it can be seen from table 2, instead of decreasing, the damage along the BL increases. Theoretical and experimental results are similar up to 0.015. (columns 3 and 5). After this point, damage can no longer be caused by LBL. It is also not caused by the stress created by the second phase, because stress at the second phase is determined by increasing inflow of the destroyed particles. Perhaps it is transferred into a transition zone which is characterized by turbulent spots in the LBL or into the turbulent mode where shear stress is determined by chaotic turbulent flow and leads to significant effective mixing of the flow. The results of experiments are given in Table 2. According to table 2, the relative agreement of the results of damage begins from the distance of more than 0.25 (i.e. in the TBL). On distance from 0.15 m to 0.25 m it is characterized by a transitional zone (turbulent spots in LBL). Physically it is explained by the fact that at BLS, the flow inside the BL is changed significantly. Vortices are formed around the curved surface. Transformed flow interacts with the flat surface of the undamaged wall. These transformed flows also change flow conditions (i.e. transfer into the turbulent mode). Therefore, short-term compression caused by injury can lead to a transfer of a LBL into a TBL. Let's calculate shear stress in the TBL. We will use the law of resistance of Blasius [7, 8] for Reynolds number less than 100.000:τ = 0.03955 u 2 ρ . If dog was injured, then d = 0.015, v = 3.78·10-6, ρ = 1.056 compression by 25% . Results are given in figure 6. Shear stress inside turbulent boundary layer. Horizontal axis: peak velocity ( ); vertical axis: shear stress ( ). Legend on the right: shear stress in laminar and turbulent boundary layers ( ). Shear stress at compression resulted from injury. 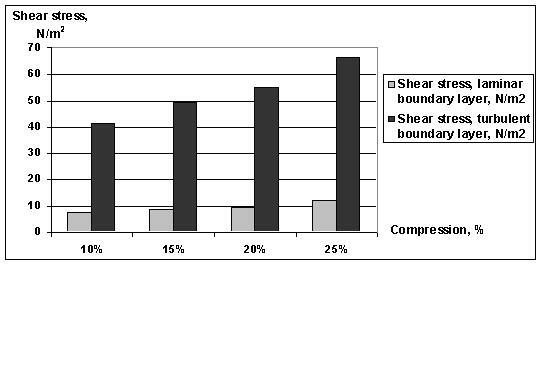 Horizontal axis: compression (%); Vertical axis: shear stress ( ). Legend on the right: shear stress in laminar and turbulent boundary layers ( ). 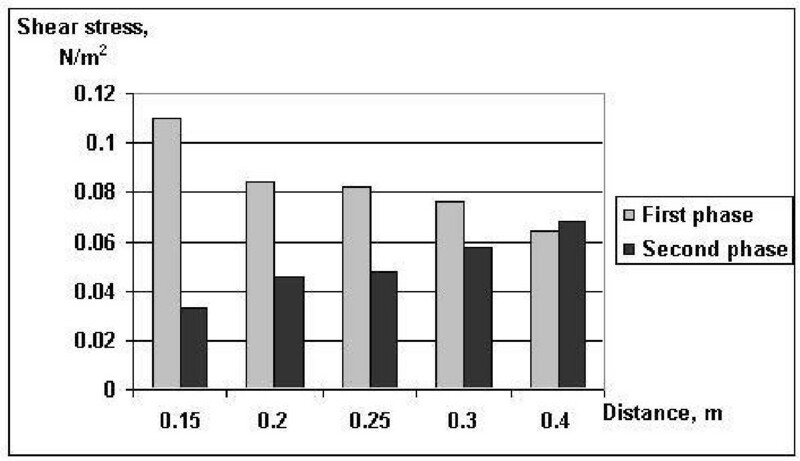 According to figure 7, compression of 10% or greater leads to the damage to the layer of endothelium. Calculations, however, are given at peak velocity 2.9 . Therefore, only certain injuries can lead to the damage of the layer of endothelial cells. Injury that caused sudden compression of the aorta that happened within the range of Reynolds number of 2,000 – 20,000 and within 0.039 to 0.392 s leads to BLS on the curved surface of the vessel. The curved surface of the vessel (upon sudden acceleration with compression caused by injury) results in shear stress that can exceed the physiological value. Damage of the vessel wall is the function of the shear stress. Shear stress of the second phase (2nd phase) can reach the same order of magnitude as the carrying phase (1st phase). Sudden compression caused by injury may lead to transfer of LBL into TBL. or compression of 10% or more and velocity greater than 2.9 occur simultaneously, then a critical value is reached, which causes the damage to the layer of endothelium. The high peak velocity and/or significant compression are necessary to cause the damage to the layer of endothelial cells. The mathematical model constructed in our study estimates the short-term aortic hemodynamic conditions at the time of chest or abdominal contusion. At present these properties cannot be determined directly in vivo. Navier-Stokes equations, multiphase equations and BL equations have been used for decades to describe fluid dynamics; however, this study is the first attempt to describe hemodynamic variables at the moment of injury. Traumatic agents cause different types of blood flow changes depending on the location of the trauma. If the chest or pelvis were injured, then the blood flow motion, although moderately accelerated, may not become sudden because the rib cage or iliac wings act as a shock absorber. If, however, there were an abdominal injury or anterior-posterior pelvic fracture, then the acceleration is significant and, therefore, the blood flow motion is sudden. According to autopsy findings, the majority of patients with aortic injury have either rib and/or sternal fractures indicating significant chest compression . We report in this work that sudden aortic compression caused by trauma leads to separation in the BL. The study of flow separation from the surface of a vessel wall and the determination of changes in the blood flow that develop as a result of the separation are among the most fundamental and difficult problems of hemodynamics. To the best of our knowledge, a clear mathematical explanation of the physical processes leading to the separation has not been reported so far. Observations of the importance of BLS include its role as the initiating factor in the development of intimal and neointimal hyperplasia at vascular anastomoses [18, 19]. BLS has been shown to predispose patients to atherosclerosis at arterial bifurcations . LoGerfo also suggested that BLS is an important factor in the localization and progression of the atherosclerosis rather than an initiator of the disease . There is evidence that high shear stress may cause endothelial injury . However, the shear stress required to damage the endothelium is far beyond that found in the normal physiological conditions . We found, however, that the value of shear stress is directly related to the value of the force of acceleration that results from injury. Trauma, therefore, due to possible significant compression might cause an increase in the value of shear stress as much as 3-fold. 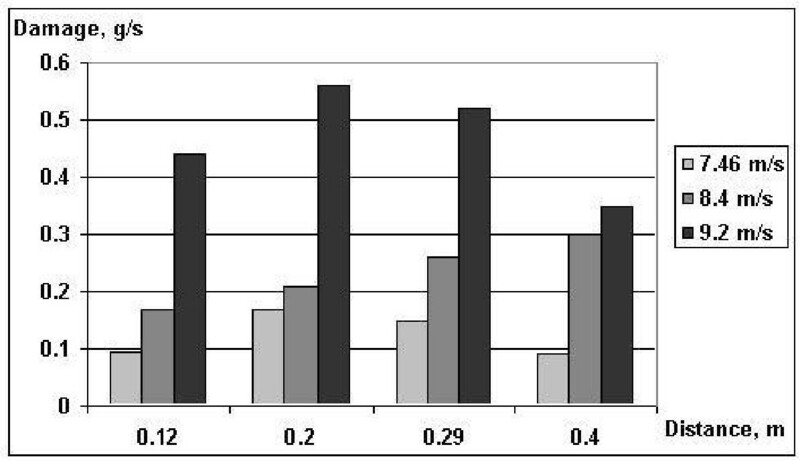 In the study by Ochsner et al. 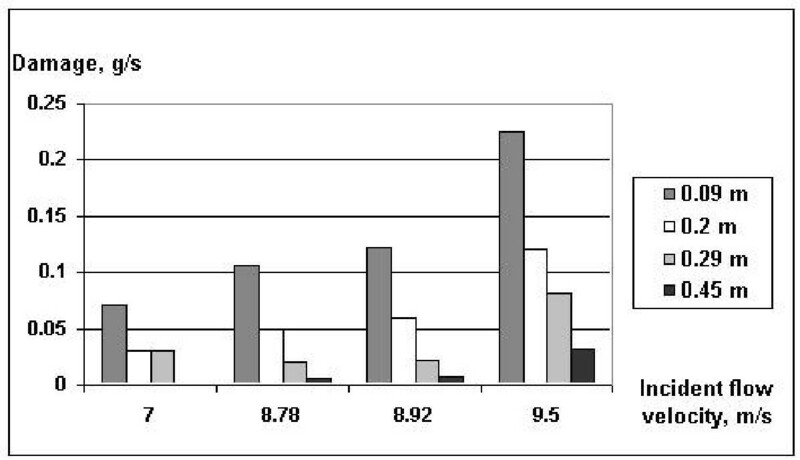 83% of aortic ruptures occurred in patients with an anterior-posterior pelvic fracture pattern, and an incidence of aortic rupture was more than 9 times greater in these patients than the incidence of aortic rupture in the overall blunt trauma population (7.5% vs. 0.8; p < 0.001). Interestingly, there was no increased incidence of aortic rupture among patients with any other pelvic fracture patter, such as lateral compression where iliac wings might possibly act as a shock absorber. We report that sudden compression as the result of the injury leads to blood turbulence which is one of the seven known agents that contribute to human atherogenesis [23, 24]. Generally, the presence of turbulence in the cardiovascular system is an indication of some type of abnormality [23, 24]. For instance, depending on the phase of the occurrence of turbulence during the cardiac cycle, turbulence near a cardiac valve might indicate either valvular stenosis or regurgitation [23, 24]. Turbulence has been shown to be a risk factor for atherosclerotic plaques, since plaques predominate in turbulent flow areas of the bloodstream, such as points of arterial branching [23, 24]. Our research has the potential for improvement of safety features of motor vehicles. The design of seatbelts and airbags should take into account the forces acting on large blood vessels as well as associated pressures. The data on injury from crashes can be used to compare injury outcomes from seat belt use or airbag deployment and to predict forces affecting the chest. The collision reports will become the basis for classification of actual forces that are produced by a motor vehicle crash. On the other hand, this work may become a basis for comparison of injury data with physical forces to establish a relationship between the range of injury and the nature of forces involved under different scenarios of deployment of safety features. This information will be useful for maximizing the protective effect of seat belts, airbags and other safety devices. Certain injury conditions can cause damage to the endothelium (for instance, the significant degree of compression resulting from injury). Our research may point up new ways of reducing the damage from blunt trauma to large vessels. It has the potential for improvement of safety features of motor vehicles. This work will better our understanding of the precise mechanics and critical variables involved in diagnosis and prevention of blunt trauma to large vessels. RI designed the study, assisted in performing experiments, performed mathematical analysis and drafted the manuscript. NS participated in the design of the study, drafted the manuscript and assisted in mathematical analysis. JS and LK conceptualized the research and assisted in drafting the manuscript. IK performed experiments and assisted in mathematical analysis.